Since the invention of memory foam, it has become the most popular bedding material. This can be owed to its great ability to conform to the body contours and provide the needed support. Memory foam also gives superior comfort for a peaceful and refreshing sleep. This has inspired thousands of beddings manufacturers to make their products with memory foam. It is therefore not surprising to find an extremely wide variety of pillows and mattresses filled with memory foam. Side sleeper might think memory foam pillows are good for their sleeping style, and they are right. But which are the best memory foam pillows you can find? This page will delve into giving you the answers you are looking for. We will begin by giving you the criteria for choosing the best memory foam pillow for a side sleeper. We will then give you our picks based on memory foam pillow for side sleepers reviews from online consumers. Comfort is of great priority. If you are not comfortable, then your sleep will be ruined. Comfort will be determined by the cover of the pillow and the filling used. Bamboo, cotton and other soft fabric will be quite comfortable. Shredded memory foam is malleable and will be very comfortable. The cooling properties of the pillow also largely add to the comfort it provides. For any pillow, including a memory foam pillow, support is of great importance. The memory foam pillow you pick should easily conform to the contours of your body, providing comfort and support for your head, neck and shoulders. The pillow you choose should allow for you to adjust the filling. That is why shredded memory foam is great. Apart from adjusting the amount of memory foam, you can fluff it to adjust the softness, or amount of filling in a particular area of the pillow. All side sleepers know that this is the delicate balance that is needed for maximum comfort and support from a side sleeper’s pillow. If it is too soft and loose, then pillow will not retain the position of the head. On the other hand, a pillow that is too hard will leave you with neck pains and stiff muscles. Size is a matter of preference, but you can always get a range of pillows ranging from standard size to queen size and even king size. Here are our top rated picks of the best memory foam pillows for side sleepers with reviews gathered from online consumer feedback. All our picks are hypoallergenic, dust mite resistant and have machine washable covers. 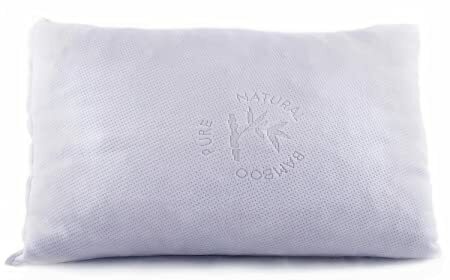 This USA-made memory foam pillow has a cover made of 60% polyester and 40% bamboo. Combining the softness and smoothness of polyester, with the cooling properties of bamboo, gives you the best comfort any pillow cover could offer. 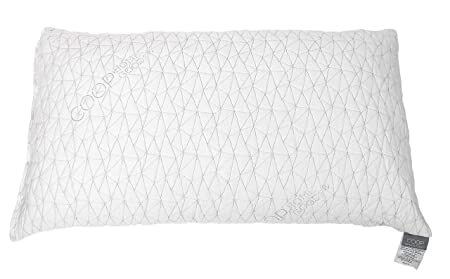 Filled with shredded, un-recycled memory foam, this pillow offers a great support for your neck, head and shoulders. The shredded foam also works with the bamboo cover for cooling and ventilation. Foam can be removed or added to the pillow for the adjustment that suits your comfort. More than 90% of the consumers have positively reviewed this mattress, citing how comfortable it is and the perfect support it offers with adjustments for a few people. However, you might find the Coop Home Goods pillow a bit heavy and it might have an initial odor after unpacking. This Snuggle-Pedic pillow’s cover is 56.4% Polyester, 43% Viscose of Bamboo and 0.6% Lycra. The Polyester offers smoothness and softness while the bamboo will keep you cool the whole night long. The Lycra kool-flow micro ventilations add to the already perfect bamboo cooling. The conforming shredded memory foam will give you orthopedic support for your neck, head and shoulders while you sleep on your side. The shredded memory foam has been designed to never go flat. A great part is that you get a 90 days refund guarantee from a 20 years warranty. You can also use this pillow for different sleeping styles other than for side sleeping. If you don’t sleep on your side only, then this is the pillow for you. Manufactured, by Good Life Essentials, this pillow has received lots of praise from both home users and hotel users for its superior comfort. It is said to be a hotel pillow since it allows for all sleeping styles, including side sleepers. The shredded memory foam filling is easy to adjust and will not lose it softness over time. It is this memory foam that provides support for your head, neck and shoulders by accepting the natural contouring of the body. 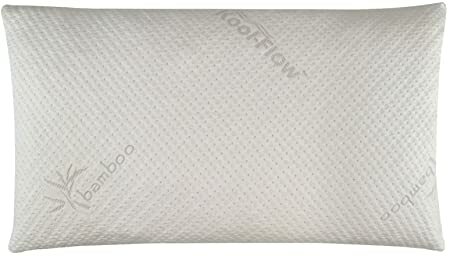 The cotton and bamboo pillow keeps you cool and prevents turning and tossing. The bamboo’s cooling properties, in conjunction with the breathable shredded memory foam, means you won’t sweat in the night or wake up to turn the pillow to a cooler side. This pillow by Sleep Innovations provides the ultimate support via its contoured memory foam. The memory foam easily molds into the shape of your head and neck and maintains its shape without much effort. This adds to the comfort and support. For a breathable pillow, Sleep Innovations has used the open cell technology on their memory foam. This allows for air circulation, leaving you cool throughout the night. Consumers have stated severally that this is the perfect pillow for any sleeping position. The comfort and support is incredible. However, you might get a slight odor for the first 3 days. The pillow might also have been too big and bulky for some users, but that is what gives it its unique and perfect support for your head and neck while you sleep on your side. This top-class pillow has thousands of consumers backing up its perfect comfort and the peaceful night sleep it offers, including the support. Molded memory foam filling has been used to provide support. The gusseted design is meant to provide maximum comfort for side sleepers. For cooling, this pillow uses a 100% cotton cover with Outlast Adaptive Comfort material. This are microscopic Phase Change Material (PCM) beads that sense the temperature, cooling you when you are hot, and warming you when you are cold. 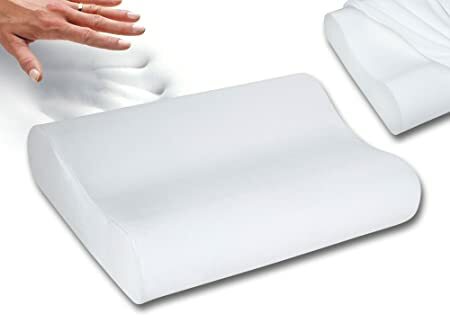 Several users found this memory foam pillow very comfortable for side sleeping. However, others might have found it too hard/firm. However, this was a benefit to those with chronic neck and shoulder pains. It took others a few days to break the pillow into the perfect comfort. An initial smoky/burnt smell might have bothered some, but it was gone in a few days. Memory foam pillows have undergone the test of time and have been found to be perfect for side sleepers. These are our picks on the best rated memory foam pillows for side sleepers. However, there are other manufacturers, like Sealy, that make equally good memory foam pillows. I hope you now have enough information on how to choose the best memory foam pillow for side sleepers. Make a purchase, and get the peaceful and refreshing sleep you deserve.